Over 40 countries will be represented at the 22nd edition of the MAKS Air Show, Russia’s premier aviation event, which opens near Moscow on Aug. 25. RBTH presents five new Russian aircraft that will be on public display for the first time at this show. The MAKS Air Show will open in the city of Zhukovsky (Moscow Region) on Aug. 25. This air show, which in 2015 celebrates its 22nd year, has long been not just the country’s largest platform for the development of international cooperation in the field of aviation, but also a spectacular show, demonstrating the latest achievements of the Russian aviation sector. Exhibitors from over 40 countries will display their products this year, and while the show will not feature vast numbers of the latest aeronautical innovations, as at any such exhibition, visitors expect to be treated to some surprises. 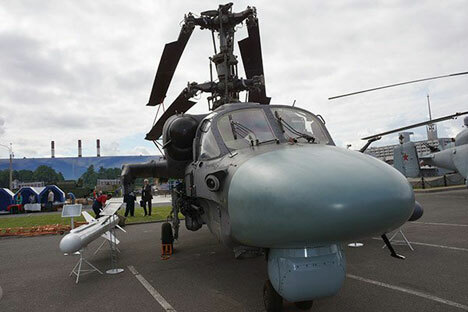 The heir to the famous K-50 Black Shark, the Ka-52 Alligator, a coaxial reconnaissance and attack helicopter, will be shown at this year’s exhibition in its naval adaptation (helicopters with folding rotor blades for deployment on ships). This unique helicopter is able to carry out tasks at any time of the day, under adverse weather conditions, while the latest state-of-the-art onboard avionics and radar allow it to utilize X-35B guided missiles, making this helicopter a proficient destroyer of ships. One of the most anticipated new products at MAKS-2015 will be the presentation of a unique unmanned aerial vehicle (UAV) – the Chirok. This aircraft stands out with its innovative design – the chassis sits upon an air cushion, which allows take off and landing on virtually any surface. Especially surprising is the unmanned cabin –yet with seats – which occupies most of the fuselage space. By the way, this is likely due to the fact that, as the website of Russia’s high-tech state corporation Rostec states – the “new UAV can be used not only in the unmanned mode, but can also, for example, transport people to remote areas”. Being displayed for the first time will be the model of a promising flying laboratory – the new high-speed helicopter PSV, which is designed to carry out research and experimental work to improve the performance characteristics of helicopters flying at speeds of up to 450 km/h (280 mph) – the top speed of this craft. This flying laboratory will allow for testing various elements of a helicopter in real flights, including on-board instrumentation. The PSV is a multi-purpose helicopter designed to serve two functions – replacing the Mi-8 and Mi-17 aircraft series. This helicopter will be able to carry 21-24 people. The Su-30SM is a multipurpose super-maneuverable fighter jet, and represents the further development of the Su-30MK family of combat aircraft. This fighter jet is equipped with phased antenna array radar, engines with thrust vector control, and canard panels. It can be equipped with advanced and futuristic high-precision weapons in the “air-to-air” and “air-to-surface” classes. The Russian navy plans to accept more than 50 Su-30SM aircraft into service by the year 2020. After the collapse of the Soviet Union, Russia was left without any small aircraft. Today they are working on modernizing and providing new engines for the multipurpose An-2 aircraft, which have remained in existence since the Soviet era. The TR-301 Monoplane is yet another modernized version of the An-2, developed by the private company Tekhnoregion. According to the developers of the Tr-301 Monoplane, their plane is lighter than the An-2 – by 450 kg (with the same dimensions and payload capacity), uses less fuel, and is much cheaper to buy than foreign equivalents.